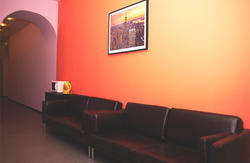 Stay Simple Hostel is a cozy contemporary hostel for backpackers and flashpackers. We always feel very enthusiastic about meeting new guests and listening to different stories during an evening cup of tea or morning cup of coffee. We like to become good friends with our guests. We reserve the right to pre-authorize debit or credit card to check if there is enough amount; afterwards the amount will be unblocked. 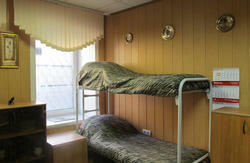 Breakfast not included - 200.00 RUB per person per day. Free wi-fi is offered in all of our rooms and lobby for all guests. Free ironing and hairdyer is always available for you. Free parking is also available under request. If you arrive early morning, you can leave your luggage and have a cup of tea before check-in. You can also order buffet breakfast, transfer and excursions under request. you need to take shuttle bus to the metro 'Moscovskaya', then take a blue line of the metro up to the station 'Nevsky Prospect'. When you reach Nevsky Prospect metro station, you need to go to exit on 'Griboedova channel nab.' When you got outside, walk on Nevsky Prospect, crossing Griboedova Channel, till you get to Bolshaia Koniushennaia ulitsa. You will see a big restaurant, called BIBLIOTEKA on the corner of Bolshaia Koniushennaia ulitsa and Nevsky Prospect. You need to turn right on Bolshaia Koniushennaia and walk till you see Louis Vuitton store. There is a big door to the yard before LV store, it may look like it is closed, but it is open. You need to go to the yard, turn to the right, then turn left. Here you will find Stay Simple Hostel! From the Mosvow (Central) Railway Station: you need to exit Railway Station and cross Ligovsky Prospect. Then walk 200 meters to the right and cross Nevsky Prospect. Then walk to the left and take any bus or trolley. You need the bus station called: 'Bolshaia Koniushennaia ulitsa'. You need to turn on Bolshaia Koniushennaia from Nevsky Prospect and walk till you see Louis Vuitton store. There is a big door to the yard before LV store, it may look like it is closed, but it is open. You need to go to the yard, turn to the right, then turn left. Here you will find Stay Simple Hostel! NB! Most public transport in St. Petersburg (bus, trolley, tram) costs 25 roubles per person; metro costs 28 roubles per person.